So having talked about novices, let’s discuss expert archers in the context of writing Fantasy. Firstly I want to distinguish between single archers and companies of archers. The primary focus of this post will be the single archer. A company of archers is a band of men trained to fight together in a battle situation. What they do is a little different. Their tactic is usually to drop a rain of arrows at an approaching force, aiming at progressively shorter distances as the enemy closes, until finally they are close enough to be shot at directly. These companies train to shoot at marks, i.e. to drop an arrow at specific distances by shooting it into the air and letting it fall on the enemy. This is different from drawing and aiming at a specific target and relies on there being many archery to produce a hail of arrows. It’s a very effective weapon used like this, as demonstrated at various medieval battles. Alternatively there are horseback archery who ride up to or alongside an enemy and pick off targets while galloping past. These were tactics used widely across eastern Europe, the Middle East, and through Central and Eastern Asia as far as Korea and Japan. The Native Americans are also said to have used mounted archery in hunting and warfare. In the case of the individual archer, the first thing to note is that the bow is not carried already strung. In particular, it isn’t worn across the body as seen in many a Hollywood movie. The main reason is that a bow made of natural materials which is kept permanently strung will eventually stay in the strung shape when unstrung and the bow will lose much of the power gained by bending it. This is the reason that modern longbow archers unstring their bows as soon as they finish shooting. In the case of composite bows, this is even more critical as the bow can de-laminate if left permanently strung (i.e the limbs will split apart as the glue fails) and the bow can injure you and anyone close by. Some years ago I spoke with one of the curators in the Royal Armouries at Leeds about some asiatic composite bows (see photo) that had been donated to the collection already strung (he thought they had been displayed on someone’s wall). He said they daren’t unstring them because they would likely fall apart so they were displaying them as they had been donated. A quick note for D&D enthusiasts. A composite bow and a compound bow are two completely different things. A composite bow is made of more than one material and is laminated (usually a combination of horn, sinew, softened bone and wood). A compound bow is a bow that uses levers or pulleys (called cams) to change the draw weight (the force held by the fingers) to make it more accurate and easier to aim. Compound bows were not developed until the 1940s and are unlikely to feature in epic fantasy. Of course they would be perfect for an alternative history – ArrowPunk anyone? Bows are deflex if the limbs (the bits that bend when the bow is pulled back) curve towards the archer when the bow is unstrung. It is reflex if they curve away from the archer. It is recurve if the limbs curve towards the archer and then away at the tips (i.e. it curves and re-curves). Some designs of asiatic bow unstrung are completely reflex and form the shape of a C unstrung (see photo) and must be inverted to string them into the classic recurve shape. This is tricky and takes practice as the whole thing can twist and snap in your hands while under tension. You don’t “fire” an arrow, despite the scene in Peter Jackson’s Lord of the Rings at Helm’s Deep. There are so many things wrong with that scene but we still love the films – my favourite is the Elven archers standing behind the wall shooting between the people on the wall at the orcs on the other side, in the dark, while it’s raining. Never once is anyone accidentally shot in the back. There is never a loose fletch that causes an arrow to spiral, or a sudden breeze causing the arrows to drift sideways. It’s perfect, but then they are elves. An arrow is shot, by the way, or loosed or let go. The term “fire” comes from firearms where you would apply a fire to the powder to shoot. Firing things is a modern term and unlikely to fit into a historical context. UPDATE: For clarity, please note that the historical claims made in the commentary of this video are not substantiated in fact. These demonstrations do require a high level of skill, but they are neither unique, nor ‘rediscovered secrets’. The techniques and skills shown are for illustration only and should not be taken as historically accurate. For instance, a back-quiver is not a hollywood myth, as stated in the narration. 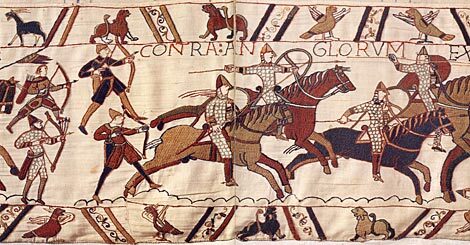 If you look at the image from the Bayeaux Tapestry in my previous post you can clearly see that one of the Norman archers is using a back quiver. There are many such mistakes and misrepresentations in the commentary, but the skills demonstrated remain impressive in execution. It’s a shame that the commentary is not of the same standard as the shooting, but it shows what an archers could potentially do. Just how exceptional the talents of Lars Andersen are is unknown, but if he can do this now then there is no reason it could not have been the case in times past. I would emphasise, though, that most of what he is doing is dangerous and that he has trained for many years. Even shooting at short range can result in arrows bouncing out of a target, going in random directions and injuring the shooter or anyone near them. Not something to try for yourself at home. As for accuracy, the archers in the traditional Mongolian archery tournament shoot at a stacked row of small cylindrical braided targets, each about the size of a large tea-mug at a distance of 75 metres for men and 65 metres for women, with composite bows that have no sights or modern aids. The judges in these contests stand next to the targets in order to judge where the arrow has hit. The arrows have blunt wooden tips rather than sharp metal or bone but, even so, being hit by one would be painful and would doubtless cause injury. The archers are so accurate that the judges lean forward to see better where the arrows hit. The competitors in these tournaments are master archers, and their arrows hit targets that are difficult even to see at that distance. This is the miracle of archery. At a distance of 75 metres, the difference between hitting the target and hitting a judge standing one metre away is an angle of less than 1 degree (0.764 degrees for those interested). The difference between hitting the target and not is a fraction of this. It’s not about maths, though, it’s about judgement and skill. It’s about feeling the wind and knowing how much the arrow will be deflected. It’s about using your imagination to place the arrow at the centre of the target from far away. It’s about years of practice that give your muscles a memory of how a great shot feels so that you can replicate it again and again. An expert archer is a formidable opponent at close range and at a distance. Being an expert archer takes years of dedication, practice, knowledge and skill. If you’re going to include characters in your story that are expert archers then give them that knowledge and skill. Have them practice that skill constantly. Make them care about the condition of their equipment, and the way it is stored or carried, whether it is damp or dry. Have them maintain their arrows and replace the ones that are cracked or broken. Have them check their bow-string and keep a spare under their hat where it’s dry and accessible. Have them check their bow after every fight and carefully unstring it so that it will be ready for next time. At the same time, draw a balance between making your story accurate and believable and filling it with irrelevant detail. Such details used well can add richness and realism, but used badly it comes across as explication or irrelevant padding that will slow the narrative and steal the pace from your story. As with all creative writing, the story comes first. I haven’t posted for a while because in my other profession I have been hectically busy. How’s it going in there? Very well, thank you, but we’re not out of the woods yet. Anyway, I was particularly taken with Chuck Wendig’s take on Things You Should Know When Writing About Guns, and I wanted to do something similar for Archery. Bows and arrows have been around since hunters decided to stop throwing sticks at the wildlife by hand, and maybe for that reason writers tend to think they are simple to make and use in a fantasy setting. After all, any self-respecting pseudo-medieval character would have known how to shoot a bow and arrow, right? Wrong. A novice bowman has about as much of a chance of successfully making a bow and arrow that can be used as an effective weapon over more than ten yards as they have of making a red carpet out of fruit. And if you’re within ten yards of your enemy, a bow is the wrong weapon to reach for. Most novices can’t draw a bow of more that 20lbs in draw weight (the force needed to draw back the string). If they can draw it, they can’t hold it. In order to shoot an arrow more than 30 yards you have to be able to draw and shoot a bow of more than 20lbs, otherwise you’re aiming in mid-air above the target and you have no idea where the arrow is going. Making a bow takes skill, time and knowledge. The right wood, taken from the right places, seasoned in the right way, crafted in expert hands, will make a good weapon. Most modern bows are laminated wood because it performs better. Most self-bows (bows made without lamination) are slow, and they warp because the mix of heartwood and sapwood expand and contract at different rates. Waterproof glue for lamination wasn’t invented until the late nineteenth century. You can make a bow out of almost any springy material and it will work to some extent. An arrow, however, must be straight and must be made of a material that can take the extreme force imparted by the bow without splitting down the middle at the nock (where the string goes) or shattering on release, or coming apart in mid-air. The fletches on the arrow must stay on and must be aligned with a constant offset angle so that the arrow will spin in the air. If they are feathers they should be from the same wing of the same bird so that they curve the same way. Arrows all need to flex by the same amount – too flexible and they’ll break, too stiff and they won’t fly straight. Each set of arrows has to be matched to the bow, the archer, and the style of shooting. And each other. Different weights of arrows fly different distances with the same force, so they all have to weigh the same too. The centre of gravity must be in the right place, just forward of the centre. Too far forward and they’ll stall, too far back and they won’t fly straight. And if you have any intention towards adjusting your aim between shots, they all need to be identical. A bow-string must be capable of holding the full weight of the bow and then stopping the bow from flying apart when it is released. Even some modern materials cannot withstand a bow being released without an arrow to absorb some of the energy. A vine, creeper, or plant will pull apart. Hair is too prone to breaking. String-making is an art, even in the present day. You don’t shoot a bow of more than 20lbs off your fingers. Its like holding a cheese-wire and lifting ten bags of sugar. It will slice into the joints of your fingers. You need a tab, or finger guard, thumb-ring or shooting glove – something between the bow-string and you. So none of this is accidental. Bows, arrows, strings and the accessories necessary to shoot them require skilled craftsmanship. That’s why there were guilds of Bowyers and of Fletchers. You had to serve an apprenticeship and learn your trade. Sure, a makeshift bow could be cut from a hedgerow, but it will be lightweight and prone to splitting. That assumes that you have a string to string it with, of the right length and capable of withstanding the forces involved. Sinew works well after hours of boiling and shaving and careful preparation, and you have the tools to hand. And then you have to make arrows. Maybe it’s just easier to go back to throwing rocks at things? From Good Friday until Easter Monday I shall be at EasterCon, which this year is being held at the Radisson Edwardian Hotel Heathrow. On Friday afternoon at 3pm I will be on stage with weapons. For reasons of safety and self-preservation, I will not be loading those weapons, but we will have some interesting pieces of video to entertain and amaze you, and I guarantee that if you see archery in a fantasy film after that, you will not see it in the same light again. It’s a promise. I will also be around for book signings on Saturday and Sunday evening, so bring your copy along and I will be happy to sign it for you. You are currently browsing the archives for the Archery category.